Mother Teresa – A Saint Or A Sadistic Religious Fanatic? 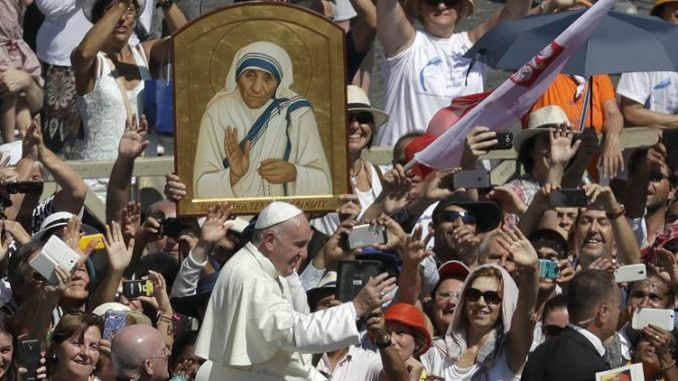 Pope Francis declared Mother Theresa a saint in a canonization Mass at the Vatican in September 2016, but there are some who say her sainthood is a fraud, just as she was. Researchers say that the nun, who died in 1997, was a sadistic religious fanatic who took pleasure in the suffering of others. They claim that the Catholic church ignored evidence of moral incompetence from the nun who denied appropriate medical care to the sick and dying. In 2013 Canadian academics published a blistering critique, titled “The dark side of Mother Teresa,” in which they said her beatification in the media was not in line with her true character. Their review which was published in the journal Studies in Religion/Sciences Religieuses, listed several allegations. Patheos reports: The nun may have been generous with her prayers, but she was miserly with her foundation’s millions when it came to alleviating the suffering of the sick and the poor. According to reports the celebrated nun had 517 missions in 100 countries at the time of her death, and that the majority of patients were not cared for properly, with many being left to suffer and die without appropriate medical care or pain medication. Indeed, conditions in the the Missionaries of Charity’s hospices were deplorable. Teresa refused to introduce the most basic methods of hygiene, even going so far as to reuse needles without sterilization. In addition to her medical malpractice, and her perverse and sadistic enjoyment of the suffering of others, Teresa was also guilty of financial mismanagement, as well as entertaining and enjoying friendship with unsavory and immoral world leaders. Yet despite serious questions about Teresa’s character, motivation and methods, as well as concerns about her suspicious financial dealings and contacts, the Vatican, enabled by a gullible and willing mainstream media, has engaged in a well orchestrated public relations campaign to manufacture a Catholic hero. Mother Teresa was not a friend of the poor. She was a friend of poverty. She said that suffering was a gift from God. She spent her life opposing the only known cure for poverty, which is the empowerment of women and the emancipation of them from a livestock version of compulsory reproduction. And she was a friend to the worst of the rich, taking misappropriated money from the atrocious Duvalier family in Haiti (whose rule she praised in return) and from Charles Keating of the Lincoln Savings and Loan. Where did that money, and all the other donations, go? Many more people are poor and sick because of the life of Mother Teresa: Even more will be poor and sick if her example is followed. She was a fanatic, a fundamentalist, and a fraud, and a church that officially protects those who violate the innocent has given us another clear sign of where it truly stands on moral and ethical questions. Bottom line: Hitchens was correct to call out the “profane marriage between tawdry media hype and medieval superstition” that is the myth of Mother Teresa, a media superstar who was in the end a fanatic, a fundamentalist, and a fraud.